I am desperate to keep my girl away from beauty queens. I'm not talking Miss America or Miss Universe or whatever they have now. I'm talking about Little Miss Sunshine and all those shows they have on TLC about toddlers and pageants and their overbearing, embarrassingly selfish fame-whoring moms. My 5-year-old daughter loves to curl up on the couch and watch a baseball game or a show on the Discover Channel. "Can we watch Dirty Jobs?" she frequently asks when she's allowed to watch a show. On a recent lazy afternoon, I said sure, fine, we can watch a show and I went to turn on the TV while she used the bathroom. My wife must have been watching a TLC nightmare about tree people or disastrous births the night before, because that channel immediately popped up and then ... froze. I couldn't for the life of me change the channel. I heard my daughter's little feet padding toward the family room, her head probably filled with Mike Rowe's sweet, manly voice or images of a baseball game. And here I am, watching a rerun of Toddlers and Tiaras. Is this weird? 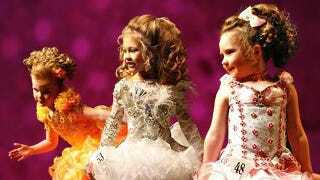 I would wager a lot of parents would never, ever let their kids enter a contest where looks are everything — where bodies and images are dissected, graded and given points and sashes. But I don't even want my daughter to even know about them. I don't want her to watch a second of those shows or to even know they're out there, waiting, available. We were watching the Fourth of July parade in her grandparents' small town this year, and suddenly there came a fleet of old timey convertibles, each with a local pageant queen waving queen-like from the backseat. "Who are...they?" the kid asked. There was the Tomato Queen, the Fiesta Queen, the local regional business marketing queen, and although I can't remember the actual name, a little 4- or 5-year-old came drifting by in a car marked "Little Miss Sweet Muffin Queen." I wanted to gag. Who would do that to their daughter? TLC would have you believe most of these kids are pushed into it by overbearing stage parents, largely moms who maybe want to relive a little of their own glory days. But I imagine some kids come up with the idea themselves, that they want to get up on stage, get dolled up, "feel pretty." Struggling to change the channel as the padding feet grew louder, I flashed on images of my daughter's reaction to seeing the kid queens. "Who are...they?" I heard her say again. And then, "Can I do that?" I leapt up and turned off the TV. "Damn it," I said, "Broken." My daughter shrugged and we went to play with some paper dolls a friend found for her, but I spent the rest of the afternoon knowing I can't shield her from everything forever but wondering which things are OK to let in. Mike Adamick writes at Cry It Out! The only queen he likes is the dancing one.